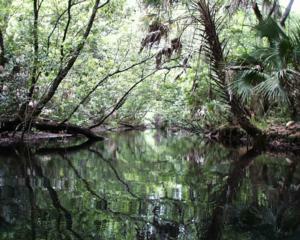 Water Level: Juniper Springs is resistant to low water because it is spring fed. Special Regulations: No disposable containers are allowed on the stream. Directions: The entrance to the Juniper Springs Campground put in is on the north side of.Route 40, just over 3 miles west of Route 19. Route 40 exits from Interstate 75 west of Juniper at Ocala or from Interstate 95 east of Juniper near Ormond Beach (just north of Daytona Beach). Directions: The takeout is on Route 19 about 3 miles north of the intersection with Route 40 (east of Juniper Springs put in). 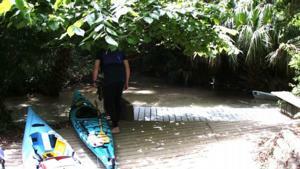 On the water, you'll know you're at the take out when you come to the bridge over the creek. The take out is just past the bridge on river right. 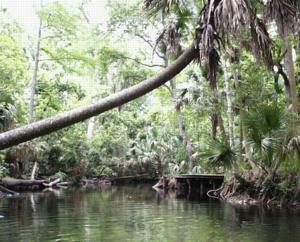 Juniper Springs is one of my favorite paddles; a classic, spring fed Florida stream representative of many in the North-Central aquifer of the state. Despite heavy weekend and use, the stream is relatively clean and natural with abundant wildlife. If you're a kayaker, I suggest taking a two part paddle so you can use one half in the winding turns in the first mile or so. 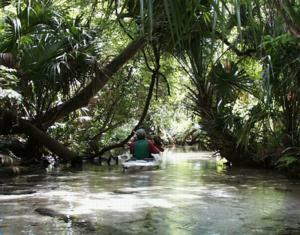 And take a boat that is easier to turn ( with some rocker ) to make navigating the upper turns more relaxing. The top section, pictured at left, is narrow, covered by a beautiful canopy, and only inches deep in most places so it's easy to see the sandy bottom through the crystal clear water. 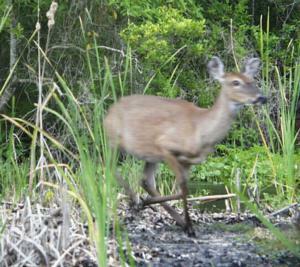 Wildlife was abundant and visible. 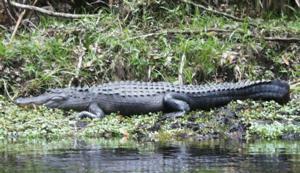 I rounded a log and came across this 6 foot alligator resting on the bank. Farther down, some bottom sediment from leaves and other organic material in deeper, broader parts of the creek darken the bottom turning the surface more reflective as shown in the photo at the top of the page. 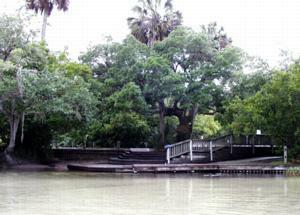 There is a convenient deck (shown at left ) on river right that makes a nice lunch stop as well as a place to take a short walk. Remember NOT to feed the animals. 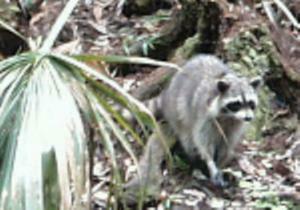 This raccoon at right eyed us from the other side of the creek with more than natural friendliness. He'd probably been fed by the clueless. 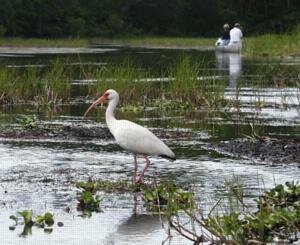 Farther down stream, the creek meandered through marsh, where we saw the deer and ibis shown below. The deer remained calmly grazing in the marsh grass about 20 yards away from us for many minute until it sprinted for cover as a rain storm hit us. You'll know you're at the take out when you come to the bridge over the creek. The take out is just past the bridge on river right.